Teaching is a good way to engage young people and educate them on the benefits and realities of these jobs. No matter you select services industry or cloud or mobile or software development, if you can also engage in teaching, you will have a big impact. Just wanted to say a quick thank you to our friends at Digital Journal for hosting this STEM chat as well. I think that just knowing other women in the field and having a chance to share experiences makes a huge difference. I'm thinking back to my women's group in the CS program at University -- that was really transformative for me. This can be extended by having women writing about their experiences, although internet harassment is a big disincentive to doing that. 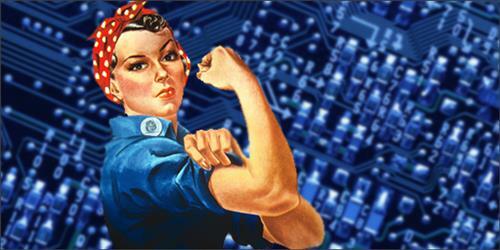 Here's a great listing of organizations supporting women in tech. Yup, I'll have to go back to my first statement where early education in life is key. Let's empower teachers to inspire children to discover the world with STEM. Build context and interest in how the world works. Encourage and teach how to ask good questions, how to challenge, and how to think critically. I am a member of IEEE Women, they have meetings and facilitate discussions. I agree with Cecily that sharing experiences makes a big difference. FITC has a initiative for women to go to their conference they've been running for over half a decade now. 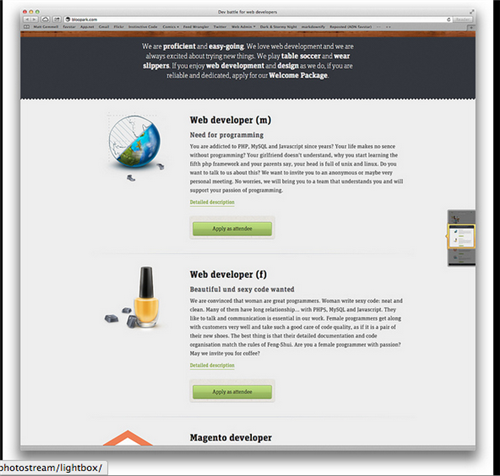 For organizations, I can plug my own Dames Making Games: http://dmg.to not just for game developers! @cecily.carver In my early career as only women in electronics/instrumentation co., I found other women in the sector and we encouraged each other. 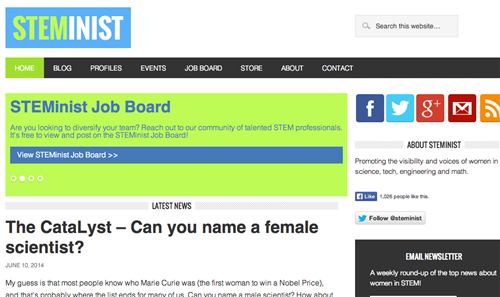 Created in 2010 by Ann Hoang, STEMinist focuses on women in Science, Tech, Engineering and Math. 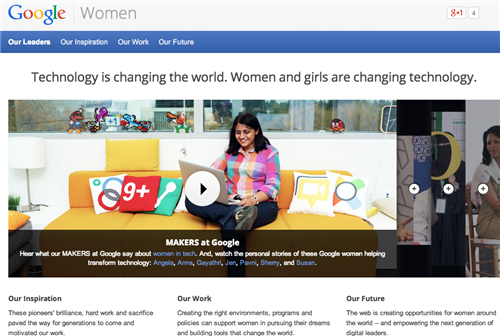 The site seeks to: "Increase the visibility of women in STEM; Promote and elevate the perspective of women in these traditionally underrepresented fields; Encourage younger women and girls to pursue careers in STEM; and Capture a social media snapshot of what’s trending for women in STEM." HackerYou, Canada's first coding bootcamp, is about 70% women participants, which is very unique. I think the internet community does a good job of shutting down sexist things such as this, but they should be prevented from even being posted. As a recent mother and one who went back to work after a year of mat leave, I quickly realized that not all companies are actually family-friendly. I quit and sought out a company that was. Reality is, we face different choices and some companies need to shift to attract female talent, if they truly value a diversified workforce. And if a company doesn't, they're not reading the overwhelming amount of literature that correlates diversity with a healthier bottom line. And yes, that is more than just gender diversity. 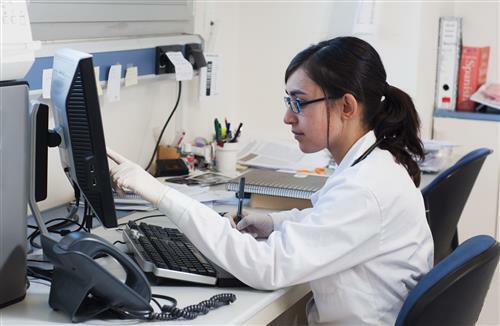 ScribbleLive hosted a chat on the shortage of women in the essential STEM (science, technology, engineering and mathematics) career fields. We were joined by Cecily Carver, Co-Director of Dames Making Games; Tendu Yogurtcu, VP Engineering at Syncsort; Jen Lamere, a 17-year-old who won the TVnext Hackathon; Laura Plant, Director at Ladies Learning Code; and Mélanie Attia, Director of Digital Marketing at Silanis Technology. Our experts discussed how to get more women to enter into the tech field, the obstacles they face, what it's like to work in the field, what can be done to lower barrier to entry and much more. I think every aspect of business will be eventually tied to IT. It will be as essential as the electricity that powers our lives. Weaving that context early on in school and at home will help bridge the gap and remove the stigma.